Just updated my work laptop to Windows 7. Sweet right? Except now the fun of getting everything to work. I gave the user modify and my app finally builds! Hopefully not too many more roadblocks going forward.. Sometimes, I just wonder why things that are useful in previous versions of things get removed. In SQL 2000, in DTS, there was an ODBC destination, you could write (insert, update, etc) to a foreign (non MSFT SQL) system easily. DB2 – no prob, MySQL – heck yea. For whatever reason, in SQL 2005 Integration Services (SSIS), that ability was removed (in SQL 2008 SSIS there is an ADO.NET Destination that can update ODBC sources, so they brought some functionality back). 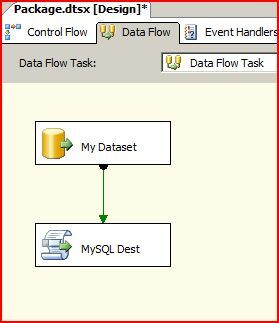 2) In your DataFlow, create your OLEDB Source and get your query returning data, throw a Script Component on the Data Flow and make it a Destination. Excel 2003-2007 Assistant. NO EXCUSES to not upgrade! What the link will show you is the differences in commands between Excel 2003 and 2007, so users can learn how to do things with the Ribbon. What this means, is that there are NO MORE EXCUSES to not upgrade to 2007. Hey, with Office 2010 around the corner – March 2010, you better get ready for it, and there no time like now to upgrade from 2003! Parent/Child. Order/Line. Header/Detail. Report/Sub-Report. We have all ran across these database designs and have had to write queries off of them. You usually end up having the parent id, and you need to get the children. Or you have a list of parents and need to loop through them, looking up the children records and doing something with them. But what if you just want a list of the children id’s (or names, or whatever). Do you really need to loop through the parents and lookup all the children, (and possibly look through those)? You can do JOIN’s and you can get the data in a tablular format, but how do you rollup those children records? 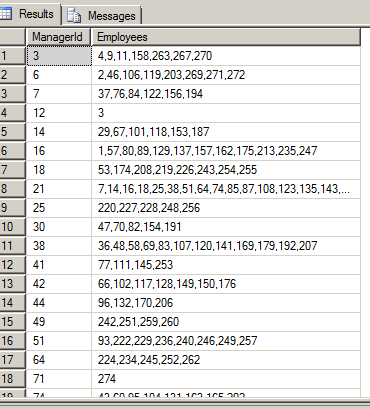 One of the cool new commands introduced in SQL 2005 was the PIVOT command (and UNPIVOT). One thing that has always irked me about PIVOT was that you need to “hard code” the column names you want to actually pivot on. This is usually fine for a static report, say you want to pivot on Apples, Oranges, Bananas. Great. But what if you want to pivot on Month/Year? “Apr 2009”, “May 2009”, etc, etc. Still ok, if you want to hardcode your month years and they never change. But in some cases, you need to keep adding the current “Month Year” combo to the query. You can go the old fashioned route and create a dynamic SQL statement and do an EXEC (@dynamicSql) , or you can try to figure out a way to do your PIVOT dynamically. What I did here is create a dataset and added a numeric ordering and then pivoted on that instead of the the actual value “Month Name Year” (eg: “May 2009”). That way, my pivot is always the same, 6 months worth, or whatever you like, and you can pass in parameters for the date filters in the top query to get your correct range.